Why does funding matter for equity? Inequities in funding are foundational to all sorts of other inequities in our schools. Yet as a nation, we continue to spend less on educating our low-income students and students of color — the very students who could benefit most from additional support. The federal government has an important role to play in providing investments for vulnerable students in exchange for improved outcomes for those students. While far from perfect, the Title I formula allocates Title I funds in a way that benefits the highest poverty districts1 and schools in each state. High-poverty districts within a state generally receive more Title I dollars per poor student than wealthier districts. Within districts, high-poverty schools must be first in line for Title I funds. Maintenance of effort: States cannot reduce their investment in education by more than 10 percent from year to year. If they do, they may lose some of their federal funding. Supplement, not supplant: Districts must demonstrate that schools received all the state and local funds they would have gotten if there were no federal dollars on the table. Comparability: Districts must demonstrate that schools that receive Title I funds got at least as much state and local funding as schools that do not receive Title I dollars. For the first time, states must include actual per-pupil spending by school on state, district, and school report cards. These expenditures must be reported by funding source (federal, state, and local), and must include actual personnel salaries, not district or state averages. The U.S. Secretary of Education can set up a pilot program that would allow up to 50 districts to combine funding from multiple federal sources, as well as state and local sources, to create a weighted student funding formula. To be approved for this opportunity, districts will need to show that their formula allocates more money per low-income child, and at least as much money per English learner, to each high-poverty school than that school received before the pilot. If the pilot is successful, the secretary may expand the program to all districts. 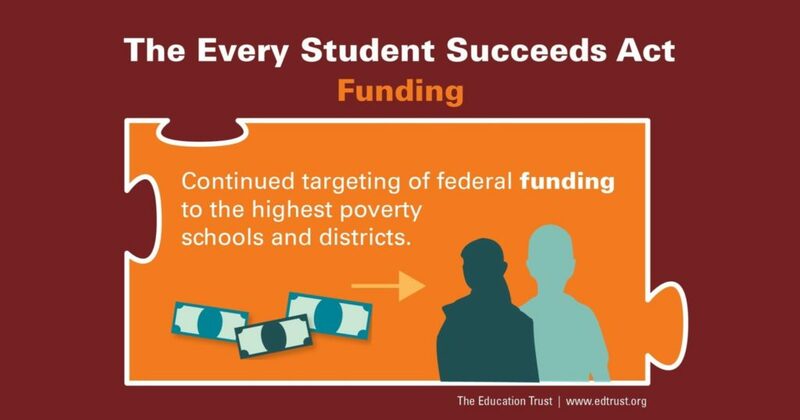 How can the new data on school-level expenditures be used to fight for greater funding equity? How will districts that choose to participate in the weighted student funding pilot distribute funds to schools?